“Here We are, born to be kings, we’re the princess of the universe“,30 years ago Queen where the kings of rock stadium. 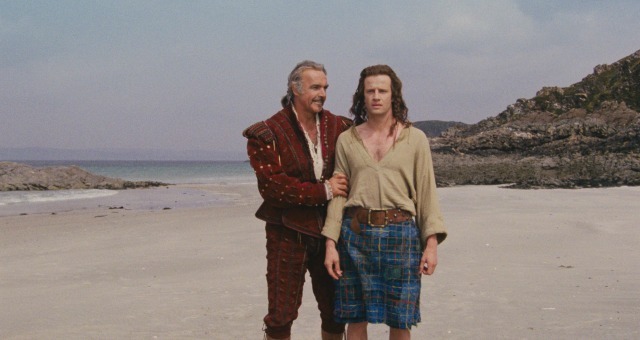 This was also the year a Belgium Christopher Lambert pretends to be Scottish and then there was Sean Connery been Sean Connery and Queen sung the soundtrack. In 2016 they will once again fight for ‘the prize’ in a 4K Restoration to celebrate the 30th Anniversary of Highlander, don’t loose your head! Russell Mulcahy’s cult fantasy hit was the MTV generation (1980’s) ultimate action fantasy blockbuster spanning 4 sequels, a long-running TV Show, even a animation tv show. Stealing a line from the film itself ‘there can be only one’ and now we celebrate it with great nostalgia. 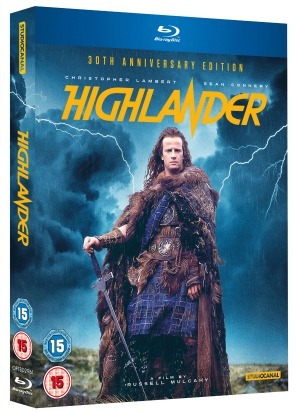 Despite the film flopping originally at the box office, there are very few similar films that have stood the test if time to genuinely ear the right to call itself a cult classic like Highlander? In Highlander we go back to Scotland and the highlands of 1536. The battle of the clans a young Conor MacLeod (Christopher Lambert) who is mortally wounded in the battle. But to the shock of his friends and villagers, he made a full recovery believing it’s all thanks to Witchcraft and he was banished. Few years later Conor has made a new life for himself, he has a new wife Heather (Beatie Edney) but just as things start to look good for him his life changes forever. He is visited by Juan Sanchez Villa-Lobos Ramirez (Sean Connery) an Egyptian swordsman who reveals to Connor he is immortal and can only be killed by decapitation of his head. Ramirez mentors and teaches Connor the ways of the immortal warrior and that those like him who survive centuries will come together and fight to their deaths. The battle to end all battles, the Gathering. 1985 New York City is the place with one immortal evil barbarian The Kurgan (Clancy Brown) determined to be victorious and win ‘The Prize’…There Can Be Only One! Highlander may not be seen in the same regard as some of its contemporaries but it’s totally bonkers most of all ludicrously entertaining.How many films do you know a Belgium plays a Scot (Lambert’s first English speaking role) and a famous Scot like Connery playing a Spanish-Egyptian (reportedly $1 million a day for 7 days work!)? It may leave us head scratching, confused but that’s what we love about this film. It doesn’t take itself seriously just entertains and electrify’s all our pores. Highlander may now look a little dated nowadays, in 1986 it had a lot of styles. Robert Mulcahy is from the school of MTV turn Filmmakers (possibly the one of the first), he may not have had the same impact as Michael Bay on film he certainly left his mark. The film used Garrett Brown’s Skycam Technology (as used in Euros 2016) which in the day was innovative and gave substance to the film (opening scene of WWE Hall of farmer’s Fabulous Freebirds in their full glory) like one of Mulcahy’s music videos. Mulcahy continued his musical prowess to give the film even more star power by calling up a few old friends in the shape of Queen (& Micahel Kamen) to deliver the film’s soundtrack. To this day Queen’s album ‘It’s A Kind Of Magic‘ is still one of the best most powerful film scores to date. It highlighted the importance of a good film score in a film can do wonders for it, giving it an extra dimension. Beyond the electric sword fights, the battles and humour, Highlander is a tragic love story and one of existential loneliness. Seminal B Movie action fantasy that’s simply A kind of Magic that will live forever. Despite the odd part especially in dark scenes a little too grainy or dark (in DVD version) the picture quality restored by Deluxe London is superb.It’s an HD Transfer playing to a 1:85:1 ration with solid clean crisp sound too. When it comes to special or anniversary editions of film, those extras can make and break a film too. Highlander 30th Anniversary does have extras seen on 20th Anniversary edition however what we get here is 2 fantastic interviews. There is the usual trailers, deleted scenes, audio commentary but asides the superb 4K restortation there is a superb behind the scenes documentary that’s nearly 2 hours long.Some may argue no need to update but if you dont have any version or DVD version this will become an essential purchase.